← How did Lavalier Microphones get their name? In my previous blog post on the EV664 I mentioned that it is one of the few PA microphones from the 1950’s that still sounds good through a modern system. Recently I have taken my 664 out on the road again to use it in a theatre show featuring classic British rock’n’rollers The Buddy Presley Band. Here are a couple of clips from the sound check featuring guitarist Corrado Di Ianni (aka Conrad) using the EV664 for vocals. 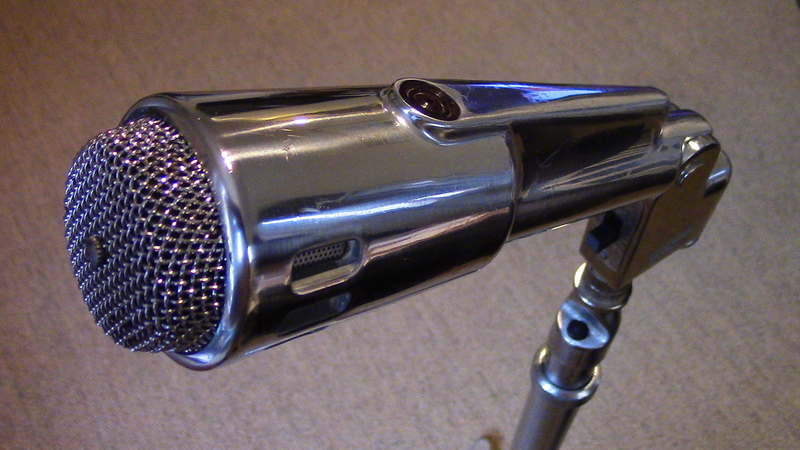 (The mic on the guitar cab is a 1960’s Philips EL6033-10 set to cardioid pattern). The microphone stand which appears in the video is the original Electro-Voice stand which came with the mic. This mic stand is a work of 1950’s genius featuring a simple push-button ratchet mechanism which allows the user to effortlessly raise or lower the stand. And after nearly 60 years, just like the mic, it still works perfectly. It is the same stand that appears in the Electro-Voice adverts of the period. Introduced in 1954 the 664 was the Electro-Voice answer to the Shure 55 and even came with a money back guarantee of it’s superiority ! 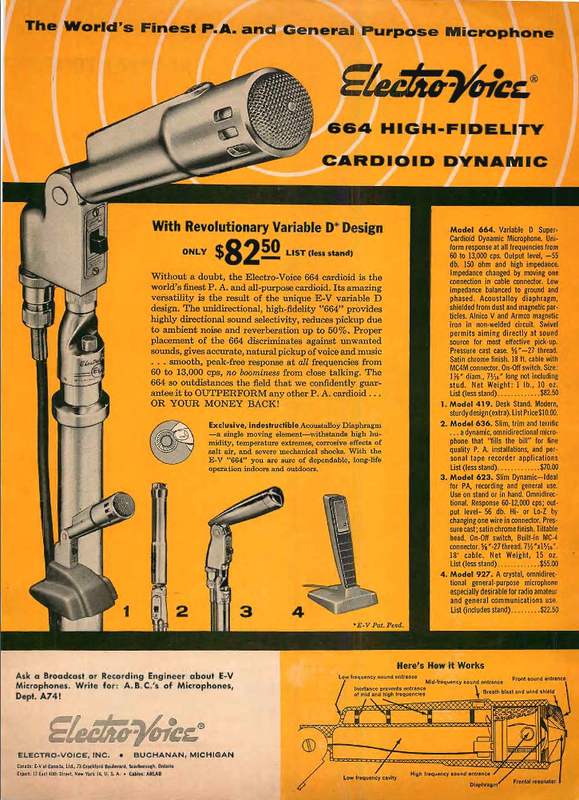 With it’s unusual arrangements of ports, illustrated in the leaflet above, the 664 was the first microphone to utilise Electro-Voice’s patented Variable-D design. 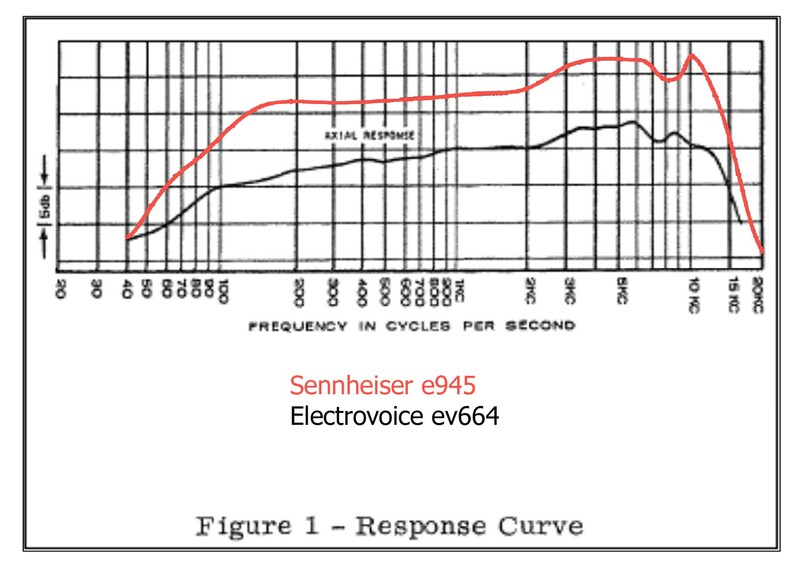 The EV664 has a crisp modern sound and I was interested to notice that the frequency response graph for the 664 is actually quite similar to the current Sennheiser e945 ! In addition to its considerable merit as a transducer the EV664 is also one of the best looking microphones ever made. A gorgeous piece of rock’n’roll art! N.B. Singers who like to clasp their grubby hands around the mic should be kept well away from the 664. Apart from messing up the proper functioning of the ports they will also leave nasty finger marks!! This entry was posted in Vintage Brochures and Tech Specs, Vintage Microphones, Vintage PA Microphone and tagged 1950's Microphone, Electrovoice EV664, Variable-D, Vintage Microphone Stand, Vintage PA microphones. Bookmark the permalink.